The forerunner to this book - Ryder, Mir & Freeman's 'An Aid to the MRCP Short Cases' - rapidly established itself as a classic and has sold over 30,000 copies. This Volume covers Station 1 'Respiratory and Abdominal Systems', Station 3 'Cardiovascular and Neurological Systems' and Station 5 'Skin, Locomoter, Eyes and the Endocrine System'. The 200 cases have been written in accordance with the new examining and marking schemes used for the exam. They provide an invaluable training and revision aid for all candidates. Robert E. J. Ryder is the author of An Aid to the MRCP PACES: Stations 1, 3 and 5, Volume 1, 3rd Edition, published by Wiley. 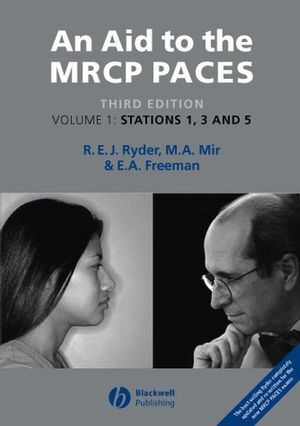 M. Afzal Mir is the author of An Aid to the MRCP PACES: Stations 1, 3 and 5, Volume 1, 3rd Edition, published by Wiley. Contents list from MRCP Short Cases 2E attached. This will be re-structured around the stations. Formal list to follow in due course. "...this is an excellent book, giving good advice on how to become a skilled, thoughtful and knowledgeable physician and hence how to become a MRCP (UK)"
"The case-by-case approach is useful in preparing for Medicine finals. Together with the examination routines, the book becomes a kind of alternative textbook to conventional clinical examination books such as McCleods." "...an invaluable companion to undergraduates in medical finals. It is easy to filter out the more obscure cases but this being said, the vast majority of the information is relevant to House Officers-to-be. This book is excellent value for money; the buy is well worth it." * Questions and answers reflect the marking system used in the exam.